Leah texts on her Net 10 track phone at the entrance of Golden Gate Park on Stanyan and Haight Street on Saturday, March 16, 2013. Leah currently lives in a hotel on 6th street and has been encouraged by friends to apply for the recently approved California Public Utilities Commission program that offers free cell phones for lower income and homeless populations. Photo by Gabriella Gamboa / Xpress. Ian Smith, 33, has been homeless for two and a half years, living in a homeless encampment under the Interstate 280 on-ramp at King Street. March 11, Smith’s home was cleared by Caltrans to make way for a fence to keep away trespassers, and he was placed in a hotel room. And to make matters worse — he has cancer. When he heard he could get a free phone loaded with 250 free minutes and 250 free text messages each month through an expansion of a program by the California Public Utilities Commission (CPUC) and the Federal Communications Commission (FCC), he planned to take full advantage of the program. 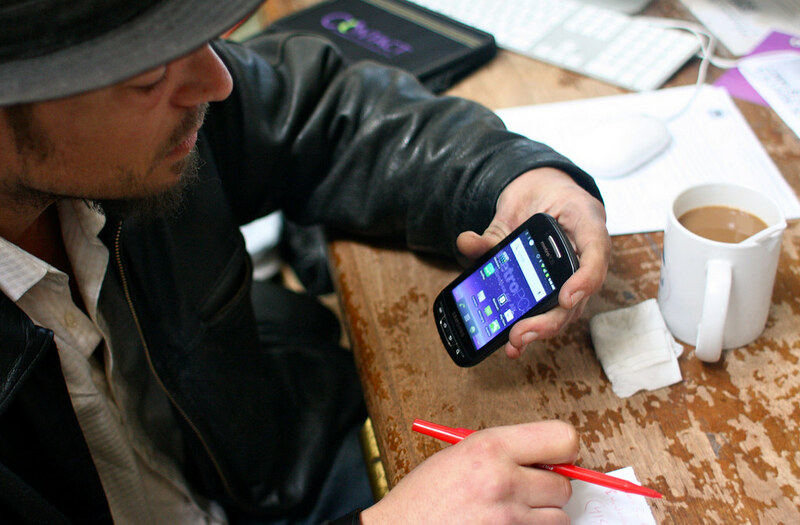 Ian Smith, the vendor coordinator at San Francisco's Coalition on Homelessness, transfers information from his limited wifi cell phone in his office to paper on Monday, March 18, 2013. Smith recently applied for a free cell phone with 250 minutes and texts through an expansion of the Lifelong Program. Photo by Gabriella Gamboa / Xpress. Opportunity calls for those who cannot afford the cost of a cell phone. Smith, vendor coordinator at San Francisco’s Coalition on Homelessness, an organization that advocates for the area’s homeless population, is one of the many people in California that stands to receive a free cell phone under the program. Approved March 4 by the CPUC, the program is an expansion of the Lifeline program, which only gave free landlines to people earning less than $14,702 a year in California. People who qualify for the program can receive a phone from Reachout Wireless and Assurance Wireless. The program was expanded with California’s homeless population in mind, according to Bevan Dufty, former supervisor of district 8 and director of Housing Opportunity, Partnerships and Engagement (HOPE). HOPE is an organization that works to provide housing to those in need. Dufty plans to promote this program trough HOPE. The National Alliance to End Homelessness estimated there are over 133,000 homeless people in California. San Francisco holds 6,455 of that population, according to the last biennial census conducted by the city in 2011. Both Reachout Wireless and Assurance Wireless stand to receive a $9.25 reimbursement per cell phone from the FCC for their services to the Lifeline program. Those who receive a free phone under the program have the option of getting unlimited calls and texts for $5 a month, according to Dufty. Jennifer Friedenbach, executive director of San Francisco’s Coalition on Homeless, also plans on promoting the program. San Francisco has supported the homeless community through the passing of Proposition C last November, an initiative that would form a Housing Trust Fund that would generate over $1 billion in revenue over a 30 year period, providing affordable housing in the city. Smith, like many other people that make up San Francisco’s homeless population, plans to survive — and the cell phone he’ll receive from vendors participating in the program will help him to do just that. How can qualified persons apply?